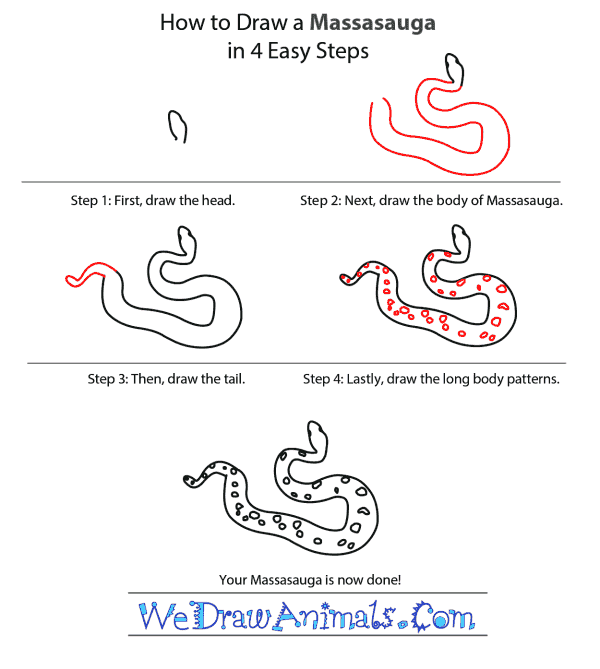 In this quick tutorial you'll learn how to draw a Massasauga in 4 easy steps - great for kids and novice artists. At the bottom you can read some interesting facts about the Massasauga. 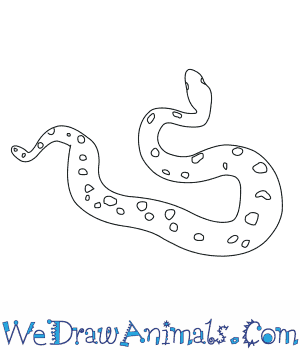 Step 1: Start with the head when you are drawing the Massasauga. It is small and narrow with eyes on each side of the head. Step 2: The next step is to draw the body. The start of the body should be smaller than the rest of the body. 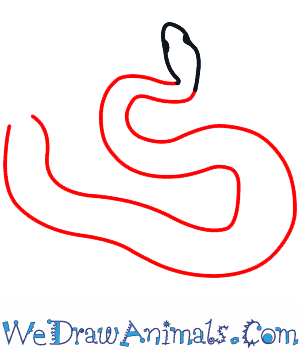 Snakes are often curled up on themselves, so you might want to curve the body. 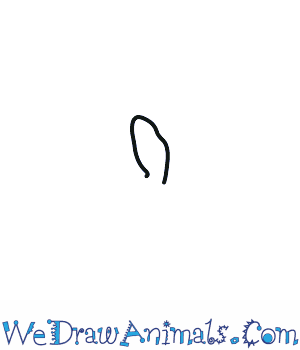 Step 3: Next, draw the tip of the tail. Some Massasauga are considered rattlesnakes, so you can add a rattle if you would like. Step 4: The last step is to draw the patterns on the body. The patterns on the body are light brown or gray. A venomous pitviper rattlesnake the Massasauga is found throughout the United States Midwest, New York, and Ontario. Unlike most rattlesnakes the Massasauga rarely uses its namesake rattle and instead stay motionless when threatened. Its considered endangered in the Midwest due to the loss of huge amounts of range. The Massasauga is the only snake in Ontario with vertical pupils. Massasauga are the only known venomous snakes in both Ontario and Michigan. Their name ‘Massasauga’ means “great river-mouth” in the Native American Chippewa language. Massasauga is considered endangered in Ontario, Michigan, Indiana, and Ohio but not by the U.S. Federal government. Massasauga are called the “Michigan Point Rattler” in Michigan and the “Massasauga Rattler” in Ontario. 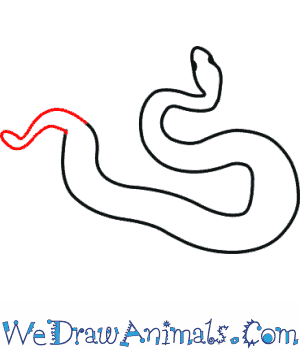 Lesson plan note: Many people think its foolish to try and preserve a venomous snake. 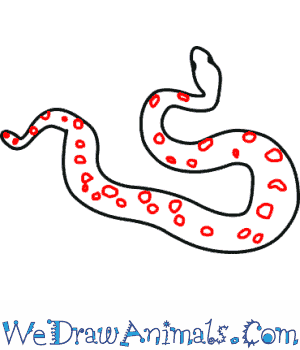 Ask students what they think about the conservation efforts for the Massasauga and other venomous snakes. Afterwards ask them if they think the effect on the food chain letting Massasauga go extinct would be worth it. Ask if the second question changes their thinking and have a class discussion on the importance of predators in the food chain.